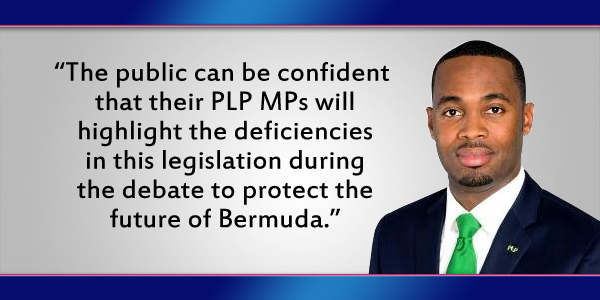 “The public can be confident that their PLP MPs will highlight the deficiencies in this legislation during the debate to protect the future of Bermuda,” Opposition Leader and Shadow Minister of Finance David Burt said this evening. This comes as the debate on the Airport Development Concession Act 2016 and the Bermuda Airport Authority Act 2016 is scheduled to take place at the House of Assembly tomorrow [Feb 10]. Mr Burt said, “From the start of the OBA’s plans to privatise the airport, the PLP has fought for openness, transparency and an airport redevelopment that benefits Bermudians as a whole. “The PLP has stood up for Bermudians using every vehicle at our disposal to force the OBA to do the right thing and come clean on the full details of this untendered deal. “At every turn, the OBA government has denied the people’s representatives access to this information in a move that betrays the values of the democratic process. “Despite the Minister of Finance being exposed for “fuzzying” up the numbers, repeated public outcry, seniors being pepper sprayed and hundreds of millions of profits going to a Canadian company the OBA intends to proceed with this deal. “Now all that remains is for our parliamentary representatives to make the case in Parliament against this deal. Yes, please have your say. The Govt. will have its way, as the duly elected Government of Bermuda. Thanks PLP and the Brilliance of Burt for Standing up for the People. The People hear you, and stand with you. We look forward to hearing the debate, and a powerful debate it will be. The people are looking forward to a Strong PLP government shortly. This issue has awaken many to the strength of the PLP as our new incoming government. Stay focus and continue to service the people. Thanks for working on behalf of the people. People Stand Together. Betty has a new name?? Ha! The brilliance of Burt!!!??? Joke, right? The brilliance of Burt. This is the same brilliance that helped run up debt as junior finance minister. That brilliance? Right got it. The PLP almost ruined Bermuda, if they get anywhere near the levers of power, they’ll do it again. So the millions lost by the PLP with out any way of recovering them is what? You are just too blind or too in their pockets to see or care. LOL. Yeah and we’ll all be living on our knees if the electorate vote the plp back into power anytime soon. They should never had a 2nd and 3rd term but they did and look what it got us. When will you ever learn! What a great legacy …. keeping us from the brink of bankruptcy …. Or the fact the OBA didn’t even try. They raised 50 million in a day 4 years ago, but they can’t raise $69 at 16%… OK, and I got a new causeway to sell you. What are you talking about? Since when did the OBA become a local CONTRACTOR?! Major difference between a private company and a government. Call the election now before the Americas Cup. Let the people decide who they want to take us forward right now at such a critical juncture. Again with the “hundreds of millions of profits” lie, it is Burt’s constant persistence to play loose with numbers and financial terminology that convinces me every time that the PLP must never be allowed to have access to the public purse. They aren’t getting hundreds of million in profits, they are getting the hundreds of millions of dollars that they spend to build the airport back with interest, just like we would have to do with any other lender. It’s not profit until the expense has been removed, and if this basic notion has to be explained to a shadow finance minister, don’t let him become the finanace minister. PLP ! STANDING STRONG ON THE THROATS OF BERMUDIANS!!!! Burt would have a hard time adding up a lemonade stand revenues. okay, I clearly see whats going on here. Lie Lie Lie Lie that is all the PLP do. It is not brilliance to lie outright to your own followers it is shameful. THE MORE YOU REPEAT A FALSEHOOD IT BECOMES TRUTH…. Bingo, the penny finally drops and you realize what your job is and what you have been elected to do. It’s about time!. Your job Mr. Burt is to go into the house of assembly and point out deficiencies in the Govt bills and have it changed or withdrawn. It isn’t meant to collude with the your mates at the unions in your desperate attempts to bring down the elected government. Now go to work and earn the money that you get paid to be an MP. Oh…..you mean the PLP are just gonna do THEIR job? The one they should have done WEEKS AGO ?? Not sure how many of you had the PLP’s flyer of ‘hard facts’ on your windshields yesterday – but at least 10 of them are simply falsehoods. Either through ignorance or malevolence. But – much like Trump tweeting provable lies to his supporters – if people don’t bother researching, they might well believe the lies. I’m not sure what the answer is in a day when politicians will lie about very easily disproved facts in order to mislead voters. And have no shame when proven wrong. Spreading false narrative is a powerful political tool. What we REALLY need is a voter base with the energy and drive to actually investigate claims by both parties, rather than just ingest what they’re fed.